10 m x 6 m heated swimming pool. 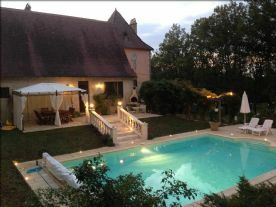 It sits imposingly in the middle of approximately 2 acres of land including a small wood, just above the stunning touristic town of Les Eyzies de Tayac. It is surrounded by woods and fields and nature, and benefits from a large amount of space and privacy, but it is not isolated as the next properties are very well within walking distance. During the summer months from May/June to September/October we actually run the house as a successful holiday property, so there is an opportunity to do the same if you're looking for a property which provides a decent income. There are two main floors to this well constructed house, and a full basement. The rooms are spacious and elegant with high ceilings. The 'L' shaped lounge and dining room are reached via stone steps and a small terrace to the front of the house. You enter into the dining room through the front double doors, and to the left is the square shaped lounge which features a huge white Perigourdine stone fireplace. The dining room door leads you to the lobby, off of which are the kitchen, the doors to the top floor and the basement, and also to a small corridor off of which are a double bedroom with fitted wardrobes and an adjacent bathroom with slipper bath and rainshower. Satellite TV and Wi-Fi are available. The top floor is reached through a door off of the lobby and via an enclosed curved wooden staircase. 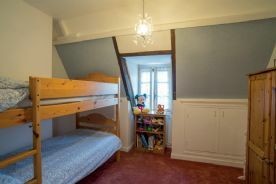 Facing you through the door at the top of the stairs is a large single bedroom with built in low cupboard storage, and a dormer window with views over the treetops to the front. 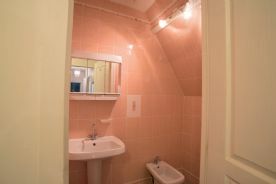 To the right of this bedroom door is a large open office/sleeping area with built in low cupboard storage, adjacent to which is a shower room and separate WC. 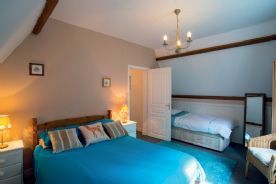 This area leads into a stunning spacious master bedroom which has great views over the treetops. 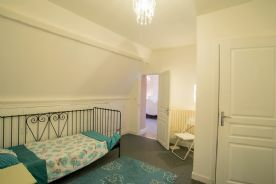 To the left from the top of the stairs, at the end of a small corridor there is a double bedroom large enough for a double and single bed. This bedroom also has built in low cupboard storage and has views into the woods. The decor throughout is mainly neutral and white with some wallpaper. There is secondary glazing and gas central heating via radiators throughout. There is an ornate woodburner in the lounge, and a larger woodburner in the basement which can be used as a very economical way to heat the water and radiators. The kitchen is a good size, is square shaped, and fully fitted with plenty of oak cupboards. It has an eye level electric oven and a gas hob. The fridge/freezer, dishwasher, washing machine and microwave oven can be left in situ if required. Through the rear door opposite the kitchen is a large terrace with a cream coloured stone BBQ. Also on this terrace facing the BBQ is a square wooden table and 9 chairs, covered by a metal framed pergola with cream curtains for shade. The terrace features elegant balustrade steps with in-ground lighting, which lead down to the poolside. Stepping stones lead you to the pool terrace under a pretty wooden honeysuckle and wisteria-clad pergola. The pool area is framed by many well established attractive plants, trees and bushes including vines and a fig tree, and features an ornamental fountain. The 10m x 6m swimming pool has Roman end steps and is a comfortable 1.25m deep throughout. The pool can be heated via a very cost effective pool heater on chilly days. We have installed in-ground remotely controlled lighting around the pool and within the garden, which makes it an enjoyable space to spend time during long summer evenings. There is also automatic sensor lighting to the front of the property, and lighting to the front gates. There are many trees in and around the front garden and a border of shrubs and trees surrounds the lawn. There is a small wood which extends from one side of the front gates to the end of the rear garden which forms an 'L' shape. The entrance to the property is via white metal gates then along a drive to and around a large raised island full of established shrubs and flowers. There is parking for several cars on the property, and a carport to the side. Downstairs in the basement, one end of it has a room which houses the central heating boiler, hot water tank, swimming pool filter pump and a sink. There is also a water softener in this room, although we have never used it. Just outside this end of the basement through the large double garage doors is a tap with garden hose and also the pool heater. This outside area is lit by automatic security lighting. 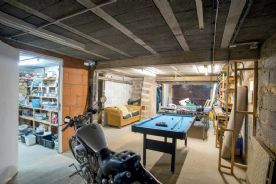 The basement could easily be transformed into further accommodation if necessary, and two further good sized rooms are already formed at the opposite end. The large open space in the centre currently houses a table tennis table, pool table and the John Deere ride on mower, but equally it could house at least 2 large cars comfortably. 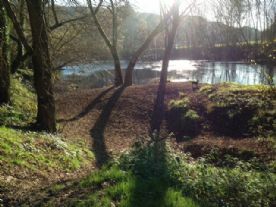 We have made several improvements to the house and garden since acquiring the property in 2011. The downstairs bathroom has been totally remodelled and modernised, the swimming pool and terraces were added. The garden which frames the pool area was formed and a wooden pergola, steps and fountain area were created to enhance the whole environment. In 2015 we added an impressive balustrade and steps down to the poolside, together with remotely controlled lighting around the pool and garden, and at the front gates. A new 4000L fosse septique was installed at the end of 2017. The surrounding environment is wooded and wonderfully tranquil, and the house and gardens are not overlooked. It's a short trip downhill to the village with its several shops, doctor's surgery, pharmacy, post office, cash dispensers, and restaurants, all in a beautiful riverside setting. 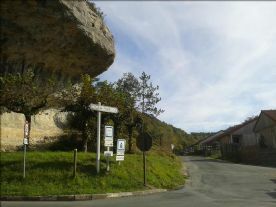 Les Eyzies is a popular tourist town and caters well for the many visitors who come each year, mainly from April to October. There are a number of cafes and restaurants in the town which provide everything from pizzas and take-away snacks to award winning gourmet delights, and some stay open all year round. 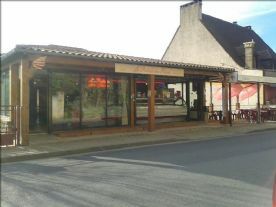 The two nearest larger towns of Le Bugue and St Cyprien are about 10 minutes by car and here you can find larger supermarkets (Carrefour, Lidl, Aldi, Intermarche), and in Le Bugue there are banks. 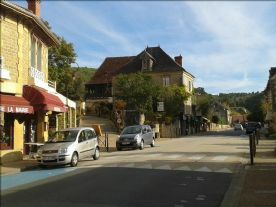 The larger medieval town of Sarlat is approximately 25 minutes' drive and here can be found more services and official offices, as well as larger shops. 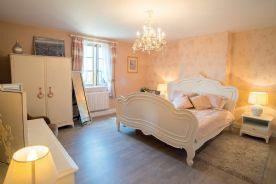 There are several interesting attractions in the area and the house is perfectly situated for major places of interest such as the Lascaux cave paintings, medieval Sarlat, Domme, Castelnaud, La Roque Gageac and so much more. 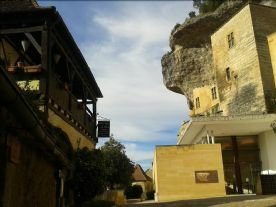 Les Eyzies has fascinating pre-historic links, a museum, the Font de Gaume and amazing and beautiful grottos, and is situated alongside the massive River Vezere. For foodies there are 13+ restaurants in the town, and several lovely places to find delicious food all around this area! 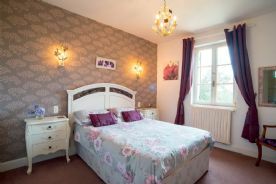 Les Eyzies is approximately an hour's drive from Bergerac Airport (Ryanair), and slightly more from Brive Airport (Ryanair). Bordeaux (Easyjet) and Limoges (Ryanair) Airports are between 2 and 4 hours' drive. 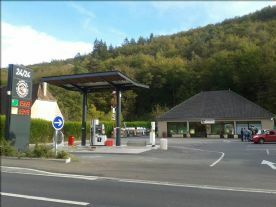 Driving from Calais takes approximately 9 hours, depending on stops and traffic conditions. Floorplans, more photos and information can be provided upon request. Some furniture may be purchased by separate negotiation if required. HOUSE SWAP - we are open to the possibility of swapping our house for a house in one of the following countries. We currently have a mortgage and so we would be looking for a fair sized house, plus a cash payment of 100,000 euros in order to make up the remaining cost. Ideally we'd like a 2 or 3 bed/2 bath non-isolated property with a garden, preferably in or within walking distance of a nice town near or at the seaside with good facilities. Preferred areas are Devon, Hampshire, East or West Sussex, Somerset, also Cambridge, but other areas except those in Scotland and Wales could be considered. Ideally we'd like a 2 or 3 bed/2 bath non-isolated property with a garden, preferably in or within walking distance of a nice town near or at the seaside with good facilities. Preferred areas are Costa del Sol towns on the rail line to Malaga City, but other areas at walking distance to the sea could be considered. We are not golfers, so not interested in golf properties. Ideally we'd like a 2 or 3 bed/2 bath non-isolated property with a garden, preferably in or within walking distance of a nice town near or at the seaside with good facilities. Preferred areas are Vannes, Lorient, Provence areas, southern Dordogne, either near the sea/beach lakes or with med and mountain views.